If you had pulled me aside when I was younger and asked if I knew the difference between store bought and fresh farm eggs, my response would most likely be, ‘eggs are eggs.’ Basically, I didn’t think there was a difference and all eggs were just delicious. However, there is a difference between the two. I first learned this difference when I went to college in Central New York. Central New York is where I developed a passion for farmer’s markets, the concept of farm to table, and the importance of supporting your local community. So what is the real difference between fresh farm eggs and store bought ones? To be blunt, just about everything. Let’s begin with my favorite part of the egg, the yolk. A lot of consumers don’t like the yolk either because they think it taste funny or they find it unhealthy. If you ask me, I’m proud to say there’s nothing I enjoy more than a nice pair of eggs sunny side up. The yolk of a farm fresh egg is typically richer in color and taste while store bought egg yolks are always a medium yellow. Not only do farm egg yolks have a deeper color, their yolk is creamier and doesn’t break as easily when cooked. Here’s a fun fact, the eggs you buy in the store are usually 6-8 months old before they hit the shelves. You may not realize it, but as time passes the egg becomes less nutritious. Many of the differences between store bought and farm fresh eggs all comes down to the nutrition and maturity of the chickens. If you hold the two in your hand, you would also notice that farm eggs are denser due to the different diets of the chicken. 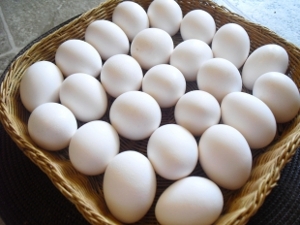 The shells of farm eggs are thicker and harder than those of store bought eggs that were developed in a major factory. Just like with your own body, you’ll get out of it what you put in. Chickens from the farm are fed with food sources of a higher quality than those who are hosted within a factory for mass consumption. This is why the yolk is richer and the shell is thicker. Farm fresh chickens spend their days outside soaking up vitamin D, while factory chickens are stuck inside eating a feed that just isn’t as good or fresh. However, it is true that the color of the shell doesn’t matter. Though many people will swear by it, there is no difference between white or brown eggs. I recently asked a farmer if there was, and was told that some chickens lay white eggs, and others lay brown. As cheesy as it may sound, chickens don’t discriminate and neither should you, unless you are given the choice between farm fresh and store bought. The bottom line is that farm fresh eggs taste better, and hold more nutritional value than store bought eggs. If you don’t believe me, then test it out for yourself. Trust me, once you have seen and tasted the difference, there’s no going back. Go support your local community and take the time to buy some farm fresh eggs because fresh will always taste better.